I anticipate that there will be a walkway and safety railings all along the track route, even over the trestles and bridges. No way they will get away without it in this day of overly cautious safety. Yeah. It looks like it could be an employee entrance of sorts. Or, could it be some kind of emergency exit for use if the train gets stuck along the route along the north of the RoA. I don't think it's a real entrance of any kind. It's right between the two SWL entrance tunnels along Big Thunder Trail. That whole area between the tunnels is just filled with dirt as a berm. They didn't build any tunnels or rooms, it was just filled in with dirt. I think they want you to "think" it is the entrance to a real mine. You can see concrete and the rock form steel structures "in" there. It just dead-ends, imo. Do they use a tow to pull the train to an area that can be used for evacuation? What if the train (God forbid!) partially derails or there is damage to the tracks? Legally speaking, I bet that there has to be some kind of rapid exit route. I am ready for another SILA vlog! Last edited by Triton; 12-28-2016, 05:20 AM. Very interesting, I wonder how long that path will be in use. It sure gives you a sense of the scale when you get closer to the rockwork...it's going to be amazing when it's finished. 5:15: Looks like the back side of the waterfall closer to the Hungry Bear. 9:30: They seem to be applying waterproofing to the top slab of the Fantasmic storage area as well as some of the vertical walls…I’m thinking there may be backfill on top for landscaping. 15:20: A much better look at the work from the newly reopened Big Thunder Trail. We’re really getting a close up view of a lot of the detail…cool! I wonder what that shed like structure at the very end will be. Last edited by Hammer; 12-29-2016, 12:22 PM. Do you guys think they will just build up rock around this entrance (perhaps to look like a cave) and is the train supposed to be visible above it? Lastly, I really hope they end up painting the bridge (I'm sure they will), cause white really stands out too much to me. I also wanted to add.......based on the concept art work for SWL, for anyone who has seen Rogue One I imagine that the new land will have the same look and feel as the city that was on the platau on Jedha.....except on less of a desert planet and more of a forest type setting.....but the feel of the buildings, ally-ways, and markets will probably be similar. Good commentary as usual from A Slice of Disney. They are paving the new access road adjacent to Disneyland Dr. at a rapid pace which means they will probably remove the old access road soon. Also, I really enjoy the great time laps videos he always includes at the end...too much fun watching this! From previous videos, there is a wall that can be seen only from Fantasyland Theater. Does anyone know why that was made to look like stone? 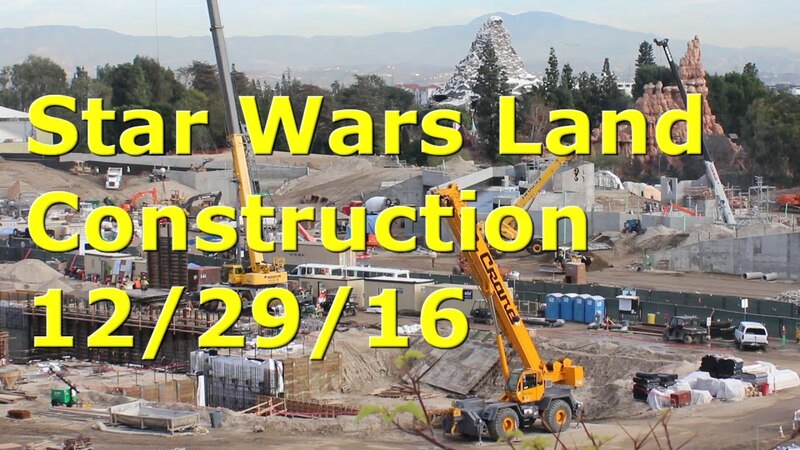 Is there intent to guests in that area... maybe loop access around the theater? That's a retaining wall, there will be planting above like a berm to block the view of SWL from the Fantasy Land Theatre. When riding on the DLRR that wall will look like a stone abutment adjacent to the tunnel opening leading to the Toontown station. I also suspect there will be additional landscaping between the DLRR and the Fantasy Land Theatre so you won't see the theatre from the DLRR which will block the view of the DLRR from the theatre as well. Last edited by Hammer; 12-30-2016, 02:20 PM. I'll try and help you a bit with three pictures. 1. 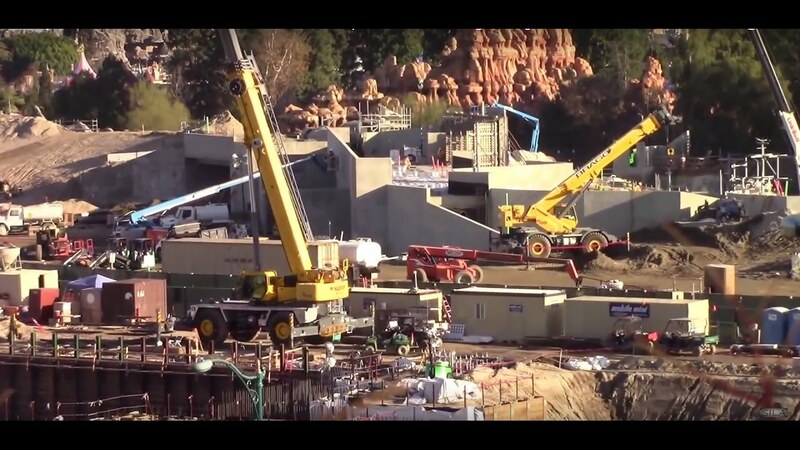 Top pic (courtesy of ShesInLosAngeles video on YouTube) is ground level of the Fantasyland entrance to SWL. This is just west of where you leave Fantasyland to enter the Big Thunder Trail. 2. Second pic (courtesy of Mintcrocodile's latest blog) shows the same view, but from the top of the second lift hill of BTMR. The lower two walls are the same as the ones in the first picture to the right of the entrance. The higher wall with the rock-work done just at the entrance to the trail tunnel is the wall you see from Fantasyland theater. This is also the higher wall in the first picture (you can make out the rock-work in the darker portion to match the rock-work in the second pic). The train will travel over the SWL entrance and into that tunnel. As Hammer said, there will probably be landscaping to the right of that tunnel in the space between the future train track and the Fantasyland Theater. 3. Picture three (also courtesy of Mintcrocodile) is the other side of the retaining walls. You can see the other side of the Fantasyland entrance to SWL and the H-piles for reference. This side of the retaining wall (also as Hammer said) will also have landscaping to block views between SWL and the FLT. Last edited by chadwpalm; 12-30-2016, 04:36 PM. Thanks Hammer and chadwpalm. I can see how that all puts together. Will be nice to see once open. The building that is going up in the rockwork reminds me of a miner's shack. It looks like 1800's style timbering and lagging is going up around the shack. There is what appears to be a mine portal off to the right, not really sure about that though. Both Shack and and the portal off to the right appear to be at guest walking level. Last edited by Triton; 01-01-2017, 02:40 AM. My guess is that the shack will be a retail outlet of some sort. And the steel framework will be some type of mining structure. Also, I am going to guess that the major foundation work going on in the far NE corner of the site, beyond where the dirt pile was, is another backstage building. 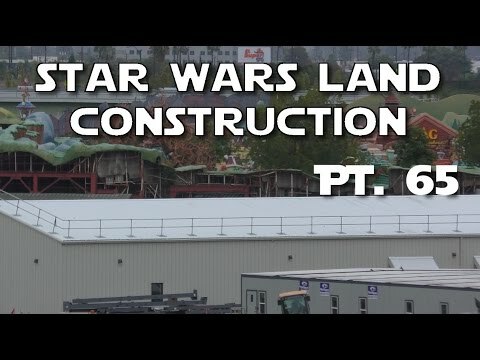 Do you guys believe that all of the shoring work (I-beams and timbers) in the big pit will be removed once the concrete is finalized? I can't see it being permanent. My thoughts were that the shack would house mining equipment (pick-axes and such) and you can look through a mesh in the window at them. The portal to the right could be a collapsed mine shaft entrance? My feeling is that it's all permanent. The beams were made flush with the ground. You'd think they would have left some length above ground to grab onto to pull out. I'm not even sure how they'd get the wood out. Plus there are those tensioning cables they installed and the moisture barrier paper they applied to the wood walls. Leaving it makes for a much stronger basement wall. I just wonder if eventually the wood would rot. Or if that even matters. Video from 12/31 but with the weekend/holiday, not much has been done. Their speculation is funny, though. I know where the DLRR goes from a satellite view, but from the parking structure, I just can't get the path as it emerges from behind the rocks along ROA up until the pony truss bridge (I think that's right). That mess of concrete near the Fantasmic! storage and those two sections of higher vertical concrete (presumably for taller rock work/peaks) is confusing me. Does the DLRR go between those two taller sections? They are definitely adding rock work to all of it.